The personal essay is the most daunting part of the college application process. This one essay, which is often no longer than 650 words, will end up deciding the next four years of your life. According to the National Association for College Admission Counseling, the essay is the most important soft, or non-quantitative, factor in your application; over half of colleges said that the essay is of considerable or moderate importance in the admissions decision. You may agonize for hours on your writing, reading it over and over; showing countless friends, teachers, and relatives; and trying to divine what the admissions officers are looking for from the university website. So, what should you do when you write your essay? What shouldn’t you do when you write your essay? Thankfully, there are a few simple - though not easy - guidelines you can follow to ensure that you write the perfect essay. The most important element of your personal essay is the grammar and writing quality. Grammatical errors, typos, and clunky sentences will get your essay dumped in the ‘maybe’ pile faster than anything else. A poorly written essay shows the admissions officer that you didn’t care enough about your application to work hard on it, and may make them think twice about your ability to complete college-level coursework. An admissions officer at the University of Pennsylvania once read an essay by a student who wanted to attend the Wharton School of Bunnies-rather than the Wharton School of Business. A mistake like this won’t do your application any favors. To ensure that your college essay is the best piece of writing you’ve ever produced, you should start writing months in advance. This may seem excessive, but starting early will give you time to work on the essay in chunks. You can draft your essay, rewrite it, rewrite it, and rewrite it again. Starting early will also allow you to leave time between each working session. This will give you the chance to come back to your work with fresh eyes; awkward sentences will be easier to spot, typos will jump off the page, and you’ll have time to craft the perfect turn of phrase. After the quality of your writing, the next most important thing is to write from the heart. Rather than attempting to figure out what’s most important to the admissions officers, you should figure out what is most important to you. Parke Muth, a former admissions officer at the University of Virginia, noted that when they asked applicants to them about an innovation or creation from the past that was important to them, UVA received over 1,000 essays extolling the virtues of the Declaration of Independence. Most of these students chose the Declaration of Independence not for any great love of the document, but because Thomas Jefferson, the founder of the University of Virginia, penned it. These applicants attempted to give the admissions officers what they thought they wanted, but they ended up submitting a generic essay just like a thousand others. If these students had attempted to think deeply about the question and had written an essay from the heart, they likely would have ended up with something far more interesting. 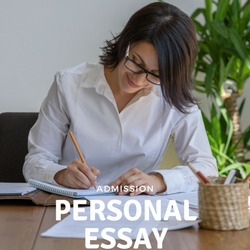 You are a unique person, so if you write something deeply personal, there’s no way that the admissions officer will see another essay like yours. Remember, admissions officers read thousands of essays every year-do them, and yourself, a favor by sending in something they haven’t seen a hundred times before. You know that you need to write something personal, but what should you focus on? You, like Walt Whitman, are large and contain multitudes. There is no way that you’ll be able to pour the entirety of your soul into a 500-word essay. Instead, you should dig deep and drill down. Focus on a slice of your life and work on bringing all the tiny details to the fore. Don’t be afraid to talk about the way the hot wind felt on your skin or the way the dizzying sounds of the city made you feel. Achieving this level of detail is difficult; it’s a technique, and your ability to write this way will come with practice and effort. During your high school career, read widely. Short stories, especially, will give you examples of writing that packs a punch with just a few words. Keep practicing your writing. After every draft, ask yourself if you are showing your readers, or telling them. If you write, “it was a hot, windy day,” that is much less powerful than, “I felt the wind tugging at my dress and sweat trickling down my back.” Adding details will pull the reader into your world and will give him or her a much better understanding of your life. Now you know what you should do, but what shouldn’t you do? First and foremost, don’t eat a thesaurus before writing your essay. Using big words does not make you sound smarter. If you are an inveterate user of words like amalgamated, cacophonous, and elucidate, you can consider using them in your essay. If you’re like most people, you should stick to the words you typically use. Attempting to use longer words to sound smarter will only backfire; your essay will be less personal and less powerful, the admissions officer will know that you used the thesaurus, and no one will enjoy reading your essay. Second, you should make sure that you write a personalized essay for each school. Be clear about why you want to attend this school and not any other. Instead of writing, “I was enticed to apply to your school due to its impressive faculty,” write something like, “as an aspiring foreign service officer, the many current and former State Department officials at Yale, including John Negroponte and Charles Hill, will be an invaluable resource.” Admissions officers want to know that you’re interested in their institution. They know that you’re applying to a number of schools, but you shouldn’t remind them of that fact. You want to let the admissions officer know that this school is the school for you. The personal essays are the part of the application that you have the most control over. Once you reach the application stage, you’ve already earned your high school grades, done all the extracurriculars you’re going to do, and impressed your teachers as much as you’re going to impress them. The essay is your chance to show the admissions committee who you are. Be sure to take the opportunity to wow them. “Chapter 3: Factors in Admissions Decisions,” National Association for College Admission Counseling. Table 7, pg. 17. https://goo.gl/rkKSfW . Parke Muth, “The Art of Writing the College Essay,” Just Colleges. http://justcolleges.com/essays/the-art-of-writing-the-college-essay/. Mark Clayton, “Personal Essays, From Pathetic to Poetic,” The Christian Science Monitor. February 8, 2000. https://www.csmonitor.com/2000/0208/p14s1.html.